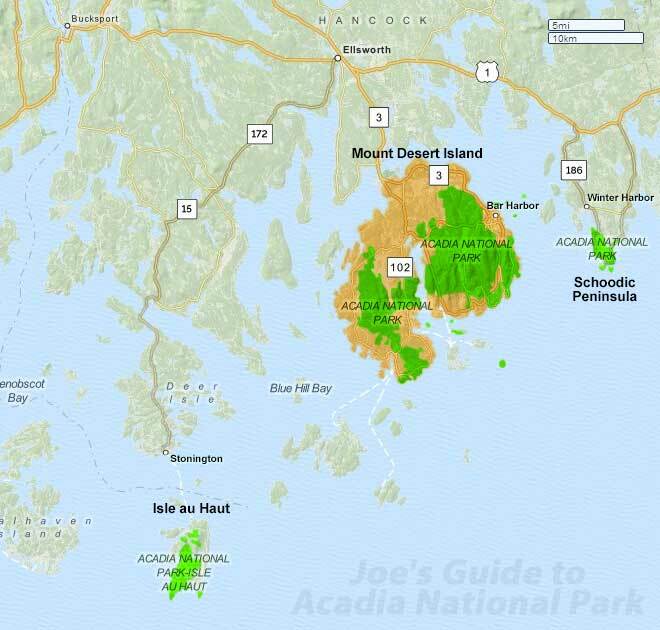 Roughly 20 miles east of Ellsworth and just south of the town of Winter Harbor, the Schoodic District is the only section of Acadia National Park located on the mainland. A visit to the Schoodic Peninsula offers visitors access to wonderfully rugged scenery of thick forests lining the granite formations of the coastline. 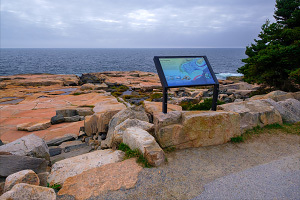 Many turnouts along the six-mile loop road (one-way in most sections) allow people to pull over and randomly explore, but the highlight is Schoodic Point, the rocky barren southern tip of the Schoodic Peninsula that offers a majestic view of the Atlantic Ocean and Mount Desert Island to the west. The Schoodic Peninsula is located five miles east of Mount Desert Island as the bird flies over the ocean, but the drive around to the mainland is much longer. If you are driving from Bar Harbor on MDI, it will take roughly 60-75 minutes to get to the Schoodic Peninsula. Take Route 3 off of MDI towards Ellsworth, then follow Route 1 east for 16.6 miles; this section of Route 1 offers wonderful coastal views. Then turn right onto Route 186 and follow it south 6.5 miles to the village of Winter Harbor. Turn left at the downtown intersection and in .5 miles, turn right onto the Schoodic Loop Road to enter the Schoodic district of Acadia National Park. During the summer tourist season, the Schoodic Ferry offers convenient boat rides to Schoodic; a round-trip ticket between Bar Harbor and Winter Harbor costs $25 per person. The free Island Explorer shuttle also offers a free bus route around the Schoodic Peninsula. Less than one mile from the start of the loop road is the Visitor Center and the entrance to the campground on the left. 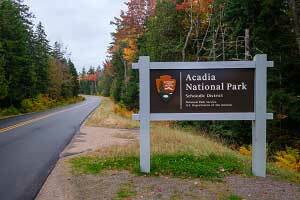 Visitors who do not have an Acadia park pass need to stop here. The Schoodic Woods Campground has 91 sites mostly for tents, but some sites can accommodate RVs. Camping is by reservation only. Located 1.5 miles down the loop road, Frazer Point is a grassy picnic area facing the waters of Winter Harbor. While this is a pleasant stopping point for groups, the scenery gets more dramatic further into the park. The southern tip of the Schoodic Peninsula (located on Big Moose Island, which is actually attached to the mainland, despite its name) is probably the highlight of any visit to the area. From the park loop road, follow the spur Schoodic Point Road (Arey Cove Road) south to the large parking area. From there, you can walk out and freely explore the massive rock formations created by ancient volcanic activity. On a clear day, you can see majestic Mount Desert Island several miles to the west. And of course, do not get too close to the water as the wet lower rock formations can be extremely slippery and the treacherous waves can be fatal if you get sucked into the ocean. Roughly half a mile past the junction with Schoodic Point Road is the small Blueberry Hill parking area that offers easy access to more sublime coastal scenery. Across the road is the start of the Alder Trail that heads to the top of Schoodic Head and looking southeast across the water is Little Moose Island. While this island is actually accessible during low tide, exploration is discouraged as this island is a refuge for birds and it is very easy to get stranded out on the island. The highpoint of the Schoodic Peninsula, Schoodic Head is located inland and is surrounded by lush forest. Several hiking trails and an old dirt road head to the summit. The views are muted compared to any peak on Mount Desert Island, but it is still a worthy highpoint. This is a favorite spot among photographers, where the tallest cliffs of the area surround several isolated coves. Limited roadside parking is located 1.6 miles past Frazer Point; do not park in or along the road. An unofficial trail heads through the woods to the exposed cliffs. Warning: take extreme care and stay away from the cliff edges as any fall could be fatal; there are no easy ways to climb up or down to the isolated coves.